Head to Las Vegas with Casino Charms, a 6 reel, 80 payline slot from Playtech. It comes with a Roxy Respin feature where you get respins with locked lady and wilds. It’s all about the Casino Charms Bonus and Free Games feature where you get free spins, free spins with locked wild reels and up to 8 Mega Respins. Casino Charms is a 6 reel, 80 payline slot from Playtech with a shiny, land-based feel – playable from 20p to £500 per spin across all devices, it comes with Roxy respins with the lady and wild symbols lock in place. There’s also a Casino Charms Bonus and Free Games feature where you spin the bonus wheel to get free spins, stacked wilds and mega respins. 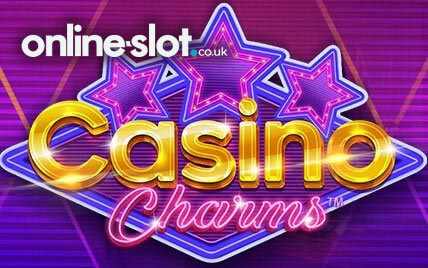 Visually, Casino Charms is bright with neon lights predominantly displayed – you’ll notice the unusual reel layout as the reels contain 3, 4, 5, 6, 7 and 8 symbols respectively. With a classic feel, symbols include hearts, diamonds, spades and clubs as well as Bars, 4 Aces, casino chips, a pair of die, green treble 7s, diamonds and lady – the latter is the most rewarding symbol with 6 across a payline giving you 10 times your stake. There’s also a wild which replaces all symbols bar the scatter – it only appears on reels 2 and/or 6. Look out for the lady symbol landing fully stacked on reel 1 – this will trigger the Roxy Respins feature with 2 Roxy Respins awarded. Both the lady and wild symbol will lock in position when they land to give you bigger payouts – it’s quite simple really. During the free spins, you will trigger the Roxy Respins feature more frequently for even more wins – furthermore, you can win unlimited extra free spins which helps. Casino Charms is quite different to what Playtech usually produces – the bigger wins will come with the free spins with 2 wild reels naturally. This makes it easier to win the maximum 800 times your stake payout on each spin, free spin or respin. Playtech are known for their branded slots so I recommend you try the DC Comics-inspired Wonder Woman.